The office of the Director of Government Examinations of Telangana state has announced the TS 10th class time table 2019.The exams are set to be held in the month of March. 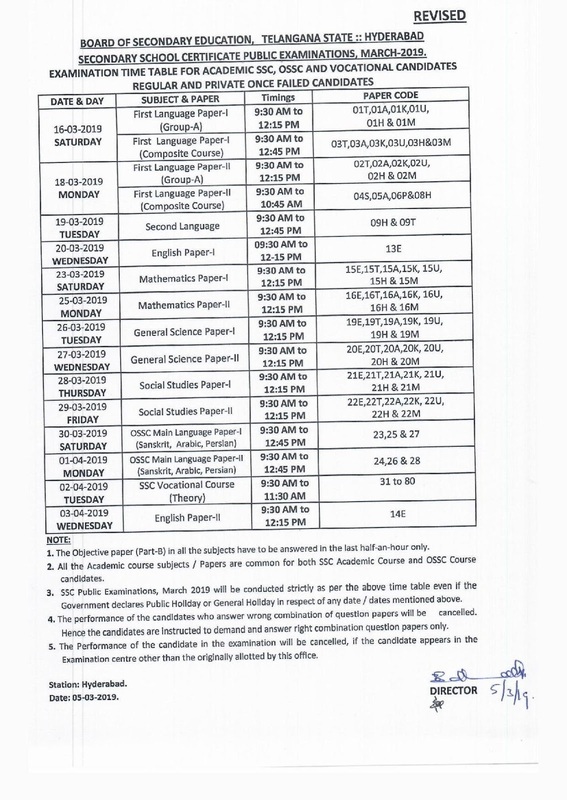 These exams will start from March 16, 2018 and end on April 2, 2019 and be conducted between 09:30 PM to 12:15 PM/12:45 PM. The director of the government examinations made it clear that the exams will be conducted strictly as per the released timetable even if the government declared a public holiday or general holiday.All the academic course subjects/papers will be common for both SSC and OSSC course candidates. Candidates should download the time table of class 10th in the second week of December 2018. The Exam schedule will be released through online mode. As per last year schedule, the TS Board exam will be started from third week of March to last week of March 2018. You will be redirected to the TS SSC Time Table 2019. Check the Exam Schedule properly. Candidates are informed to keep a hard copy and soft copy of the Time table for further use. When the ts Sbtet results ?